Florin Diacu is a Canadian mathematician and author. He is currently a professor in the Department of Mathematics and Statistics at the University of Victoria, doing research in the field of dynamical systems. He is the recipient of the Best Academic Book Award in 2011 for his volume Megadisasters: Predicting the Next Catastrophe , the subject of his public lecture at The Banff Centre on November 14, 2013. 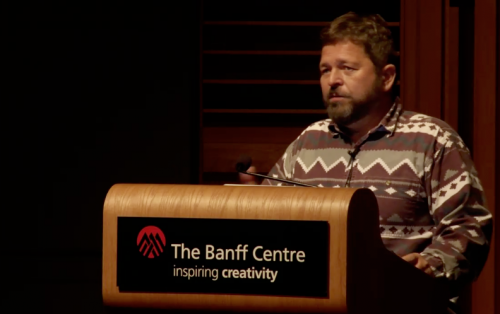 This was the second talk in a series of joint Banff Centre/BIRS public lectures, which is part of The Banff Centre's Leading Ideas Speaker Series. Diacu began research in celestial mechanics while completing his PhD thesis at the University of Heidelberg, Germany and focused on collisions between celestial bodies; however, the 2004 Indian Ocean earthquake and tsunami caused him to look elsewhere at mathematical models that affect the earth. That megadisaster killed close to 250 000 people and spurred questions relating to research on not only earthquakes and tsunamis, but also collisions of meteors with the earth, volcanic eruptions, rapid climate change, pandemics and stock market crashes, not all of which are as destructive, but nonetheless influence people’s lives significantly. During his talk, Diacu gave an example of the benefits of being educated on warning signs. In 2004, a ten-year-old girl was with her family on a beach in Phuket, Thailand. The girl noticed that the sea looked bubbly and was reminded of a movie she had recently seen about the Hawaii tsunami of 1946, which depicted a similar phenomenon directly before the wave hit. Because she recognized the warning sign, the girl was able to warn her family and the lifeguard on duty, and save the lives of a 100 other tourists who were on the beach that day.